In 2010, Panerai surprised the world by introducing a diving watch in bronze – a fascinating material that matures over time with a patina that gives a unique character. Today, for the first time, this legendary model appears in a new design enhanced with a ceramic bezel. Rare, iconic, tough and fascinating, Panerai’s bronze watches swiftly entered the world of high quality watchmaking with their very strong personality, showing that Panerai’s Laboratorio di Idee can combine the past and the future, technology and design, with consummate skill. 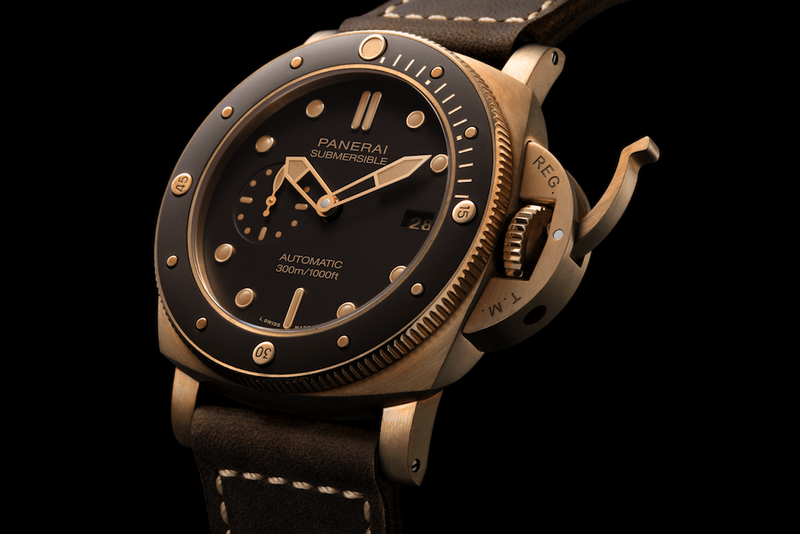 The new Panerai Submersible Bronzo is derived from those legendary creations, enhanced by a new inspiration, resulting in a watch of unique personality which is in a collection for the first time. The look of the watch is strong and decisive with its solid bronze case 47mm in diameter and the iconic device for protecting the winding crown patented by Panerai in 1955. In this new version, a micro sandblasted brown ceramic disc has been applied to the rotating bezel, which integrates perfectly with the brown of the dial and the strap made of natural leather. The patina which gradually forms on the surface of the bronze gives each example an original, dynamic appearance and it also protects it from further oxidation, without changing its properties. The Panerai Submersible Bronzo is a professional diving watch, water-resistant to a depth of 300 metres (30 bar) and with all the indications clearly visible even in complete darkness. The small seconds hand at 9 o’clock indicates that the watch is running properly in all situations and the unidirectional rotating bezel enables the safe duration of each dive to be calculated. Furthermore, the new watch is supplied with a second strap in military green rubber, ideal for activities in the sea. The P.9010 Manufacture calibre, automatic with a power reserve of three days, is wound by a bidirectional oscillating weight, which can be admired through the sapphire glass porthole on the back. It displays the time and the date, and it is fitted with the mechanical device for rapidly adjusting the hour hand. The Panerai Submersible Bronzo 47mm is available only in Panerai boutiques throughout the world – including the newly opened Panerai boutique in Pavilion KL – at panerai.com and in the Panerai WeChat boutique. The Panerai Submersible Bronzo 47mm is available at the newly opened boutique in Pavilion KL.